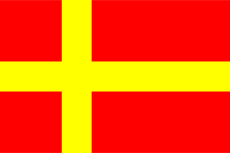 Finland Swedish or Fenno-Swedish (Swedish: finlandssvenska, Finnish: suomenruotsi) is a general term for the variety of Standard Swedish and a closely related group of dialects of Swedish spoken in Finland by the Swedish-speaking population as their first language. For the most part, these dialects and the dialects spoken in Sweden are mutually intelligible, although some archaic Swedish dialects in Ostrobothnia are practically unintelligible to Swedish-speaking people in southern Finland (and in Sweden). Most Swedish-speaking Finns emphasize that Finland Swedish is not a language separate from the Swedish of Sweden. The Swedish dialects in Finland are considered varieties of Swedish, and the norm for written Standard Swedish is completely applicable also for Finland Swedish. An often repeated "fact" is that the municipality with the highest proportion of Swedish speakers in the world, Hammarland (96% as of 2004), is located in Finland. Korsnäs has also held this title and is often cited as such. However, as there are no official statistics on the mother tongue of inhabitants of Sweden, this is hard or impossible to verify and is not to be considered a fact. In addition bilingualism is very common for immigrants in Sweden, so the term Swedish-speaking may be diffuse in that sense. A common misconception among many Swedes is that Finland Swedish is simply Swedish spoken with a Finnish accent, something that can be a considerable source of frustration to most native Swedish-speakers in Finland. Any language adopts features, especially pronunciation habits, from dominant languages it comes in touch with, but many of the traits of Finland Swedish exist also in monolingual areas and some are in fact preserved features of old Swedish, as with Scots in comparison to English, Afrikaans in comparison to Dutch, or Galician and Brazilian and African dialects in comparison to modern mainland European Portuguese. Finland has since then been a bilingual country with a Swedish-speaking minority (5.5% of mainland Finland's population in 2006) living mostly in the coastal areas of southern, south-western, and western Finland. During the 20th century, the urbanization following the Industrial Revolution has led to large majorities of Finnish speakers in all major cities. 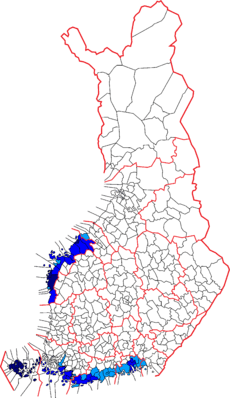 The capital Helsinki (in Swedish Helsingfors) became predominantly Finnish-speaking as recently as around 1900. A large and important part of the Swedish-speaking population nevertheless lives in the capital. The country's public broadcaster, Yle, provides two Swedish-language radio stations, Radio Vega and Yle X3M, as well a TV channel, Yle Fem. Finland Swedish mostly has the same vocabulary as Swedish in Sweden. There is a conscious effort to adopt neologisms from Sweden, to avoid differences. Nevertheless, there are differences. They are generally in two categories: Old Swedish forms vis-a-vis loanwords and calques from Finnish or independently borrowed from other languages (nowadays mostly English). There are also some terms differing because of differing legislation. ↑ "Professor Catherine O. Ringen". The University of Iowa. May 11, 2011. Retrieved 27 October 2014. ↑ "Äldre man, Brändö: Har ätit sälkött". swedia.ling.gu.se/. Retrieved 11 February 2014. ↑ "snabbmeny". swedia.ling.gu.se/. Retrieved 11 February 2014. ↑ Ringen, Catherine; Kari Suomi (2012). "The voicing contrast in Fenno-Swedish stops". Journal of Phonetics. 40 (3): 419–429. doi:10.1016/j.wocn.2012.02.010. ↑ Kuronen, Mikko. "Finns det supradentala konsonanter även i finlandssvenskan?" (PDF). Svenskans beskrivning. Hallgren & Fallgren. Retrieved 5 November 2013.